We (Anita and Deborah) attended the annual meeting of Canadian astronomers last month — the Canadian Astronomical Society (CASCA) 2018 conference — along with a crew of other Astronomy & Astrophysics PhD graduate students from the University of Toronto and the Dunlap Institute. The meeting took place in beautiful Victoria, British Columbia, one of the hubs of Canadian astronomy! It was a special CASCA this year as it was the 100th birthday of Dominion Astrophysical Observatory (DAO) in Victoria! On the first day, we attended the graduate student workshop, where we learned about data analysis methods and applied them on real data. In addition, we interacted with representatives from companies in industry who work with astronomers to build instrumentation for telescopes. We learned about how astronomers and industry make a vital team to forwards Canadian astronomical science while also giving back to the Canadian economy and establishing Canada’s place on the global scientific forefront. During the following days of the conference, we attended a series of scientific presentations from astronomers across Canada, including presentations from graduate students from Dunlap and U of T. Shout out to graduate student Jielai Zhang from Dunlap/U of T for winning a “Best Presentation” prize and Victor Chan from Dunlap/U of T for winning a “Best Poster” prize! It was an amazing opportunity to learn about the astronomy and astrophysics science that is going on in Canada. Midway through the conference, we visited the Royal British Columbia Museum with a welcome with Indigenous dances. The museum exhibits we toured were Victorian style and had models of how houses were back in the days as well as shops, roads and industry. We attended presentations about the current status of telescopes that Canadian astronomers are strongly involved with (such as the Canada-France-Hawaii Telescope, the Gemini Telescope, and the Square Kilometer Array), discussing future strategies and the ongoing programs at the telescopes. On the last night, we visited the DAO and celebrated its 100th birthday with a dome-like cake. We then wandered around, looked at the planetarium and looked through the smaller telescopes that are used for outreach. We observed Jupiter and its four Galilean moons then headed back a bit after it was dark. Celebrating the 100th birthday of the DAO! Looking out from the observatory. Throughout the conference, we interacted with our Canadian fellows in astronomy – not only networking but also forming friendships and strengthening bonds with each other. It was a wonderful learning experience, and we look forwards to going back next year! From left to right: Ayushi, Victor, Anita, Emily. And Chris Hadfield, of course! Hi everyone, Dana Simard here! I’m a PhD candidate at the University of Toronto, and I study how the light from pulsars interacts with the interstellar medium using Very Long Baseline Interferometry, a radio astronomy technique where we observe the same part of the sky with many different telescopes all around the world in order to get very high spatial resolution – the same spatial resolution we’d get if we had a telescope the diameter of the Earth. A few weeks ago, I went to Socorro, New Mexico, for a workshop on synthesis imaging, the process of going from the signal measured at all of the different stations to an image of the sky. The Synthesis Imaging Workshop held in New Mexico by the National Radio Astronomy Observatory is one of the biggest summer schools on this topic, with 150 people from all around the world attending. Our first few days were filled with lectures on everything from the basics of radio astronomy, how to build a radio detector, and how to properly calibrate your radio interferometric data to get the most accurate and precise image that you can. Over the weekend, we had a much needed break from the torrent of information to check out the local surroundings and the VLA. On Saturday, we got out to a local nature reserve, the Sevilleta National Wildlife Preserve, to get a sense of the nature and what it’s like to hike in the desert in 37 degree ‘spring’ weather. The nature reserve, being far from the nearest city and all of the cellphones and wifi signals in them, is also a great site for a radio observatory and home to one of the Long Wavelength Array, or LWA, stations. The LWA observes down the lowest frequencies that can be observed from the Earth, from 10 MHz to 88 MHz. By combining all of the telescopes, the LWA observes entire sky all the time. Curious about what this looks like? You can check out the LWA TV! After our hike, we headed back to Socorro for a star party. Since Socorro is very dry and high elevation (1400 metres), there is little moisture in the air to distort the stars, and the sky is remarkably clear. Our hike through the Sevilleta National Wildlife Preserve. The Sevilleta Long Wavelength Array station consists of 256 of these antennas. Instead of a conventional radio dish, wire mesh is placed under each antenna. Since the LWA observes at wavelengths between 3 and 30 m, this wire mesh reflects the light that the LWA is sensitive to back up to the receiver. By combining all of these receivers together, the LWA is makes a map of the entire sky all the time. Getting ready for a star party at the Frank T. Etscorn Campus Observatory. On Sunday, we got an early start to head to the Very Large Array (VLA) for the entire day. This is a network of 27 antennas, each 25 m in diameter spread out in a Y-shape 36 km across. Each antenna has many receivers, so that the VLA can observe all the way from 58 MHz to 50 GHz. Luckily for us, one of the telescopes was not observing on Sunday, so we got to climb up to the top of the antenna, and check out the receivers. The largest one, bigger than me, observes in L-band, around 1.2 GHz, which is where the 21-cm signal used to map neutral hydrogen gas lies. As we go to smaller and smaller wavelengths, towards the infrared, the receivers are smaller and smaller. The VLA dishes have a unique set-up for change receivers. Most dishes have a rotating receiver wheel that moves the receiver you want to the secondary focus. Instead, the receivers at the VLA are fixed, and the subreflector, which reflects the light from the primary focus back to the secondary focus, is asymmetrical. By rotating the subreflector, the light can be focused into different receivers. I mostly observe around metre wavelengths, and the (P band) receiver I use is actually near the prime focus, the little silver and red dipole. It shares this space with another receiver, called the 4 band receiver, which observes the lowest wavelengths and overlaps with the LWA band. The last three days of the conference were a mix of hands-on tutorials and more advanced classes, on things like how to construct an image when you’re observing over a very large range of wavelengths and what kind of problems can come up when you observe at very long wavelengths. We got to practice making images from both the VLA and the Very Long Baseline Array (the VLBA) with expert help! It was awesome to get to go through the whole process with the opportunity to ask questions along the way. Heidi Medlin helping me make an image of Supernova Remnant 3C391 during the VLA data reduction tutorial. My finished image of the quasar 3C 380 during the VLBA data reduction tutorial. And with that, we were done, and on the route back to Albuquerque to fly home after a busy week filled with lots of astronomical learning! This is the group picture for the 2018 CAP conference- about 450 people from 53 countries attended! It was wonderful to meet people from all over the world who love astronomy and want to share their love of the field with others, and to learn what methods work and what doesn’t. For example, we learned during a presentation on the 2017 total solar eclipse that it’s estimated that 20 million Americans traveled to see the eclipse… but many of those people did not travel all the way to the path of totality, despite totality being the most incredible part of the spectacle. Understanding what kind of miscommunication led to this (for example, were the eclipse maps misleading for what totality looked like?) is crucial for Toronto astronomers already preparing for the April 8, 2024 eclipse. In Toronto, 99% of the sun will be covered, and it will be important to explain to the public that even 1% is literally the difference between night and day! Besides learning what others were up to, I had a talk of my own! Over the years, I have been active on Reddit, a social media website that is the 9th most visited in the world, as “Reddit’s astronomer.” I have become successful on Reddit for posting enthusiastic comments about astronomy that begin with a cheerful “astronomer here!” and can reach literally millions of people, but Reddit is under-utilized by many astronomers who tell me they don’t understand how the site works. The aim of my talk was to explain how to use the site for outreach, and the questions I had both after the talk and in the days after lead me to believe it was well-received and there will be more astronomy-related posts on Reddit in the future. So all told, a wonderful conference with a beautiful backdrop with springtime in Japan! I learned a lot, and it was great to meet people from all over the world interested in communicating astronomy. It’s about time I caught everyone up on my last couple of exciting weeks at the South Pole! Back in the first week of January, we finally achieved ‘first light’ with the upgraded South Pole Telescope camera, SPT-3G. This means we successfully installed the camera back onto the telescope, and the detectors were responding to the light from astronomical objects (such as planets and star-forming regions). Even though the camera is designed to measure light from the Big Bang, there are many other bright sources in the sky emitting microwaves that we can use to test our instrument. It might not look like much, but this screen is showing live data from a handful of detectors on our first scan of an astronomical object. The sharp downward spikes correspond to light from a quasar, an active galactic nucleus over 5 billion light years away! 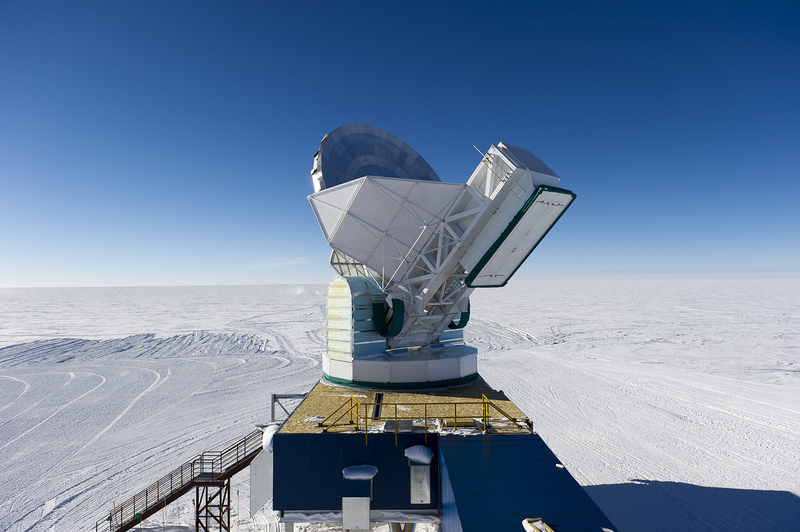 One of the primary goals of the South Pole Telescope is to measure light from the Cosmic Microwave Background (CMB); relic radiation from the Big Bang. The Universe began its life far denser and hotter than it is today, a primordial soup of light and particles. Almost 400 thousand years after the Big Bang as the universe expanded and cooled, this primordial light ceased interacting with particles and began to travel freely throughout the Universe. This is the light we see today as the Cosmic Microwave Background, providing us with a valuable tool for probing the conditions of the early Universe. Soon the camera will begin to survey a large patch of sky, measuring about 1500 square degrees (almost 4% of the entire sky). The goal of this survey is to map out tiny fluctuations in the CMB temperature, where these changes in temperature are smaller than 1 part in 100,000 (like measuring centimetre-high waves on a kilometre deep ocean). Thanks to the large 10-metre dish on the telescope, SPT-3G can map out these tiny fluctuations with high angular resolution, better than any other microwave telescope. This makes SPT well suited to particular science goals, such as measuring the gravitational lensing of CMB photons on small scales. This bending of light throughout cosmic history tells us a lot about the growth of structure in the Universe, where the growth of structure strongly depends on the mass of a fundamental particle called the neutrino. The South Pole Telescope is also a powerful tool for locating galaxy clusters, some of the most massive gravitationally-bound objects in our Universe. Clusters of galaxies are so massive that they imprint a unique ‘shadow’ in the CMB, where CMB photons have been scattered off high-energy electrons inside the galaxy cluster. We can then begin to discover galaxy clusters by looking for these unique imprints in a map of the CMB, with SPT-3G allowing us to find smaller galaxy clusters than ever before using this method. We predict that SPT-3G will eventually be able to find over 3000 galaxy clusters, with many of those being previously undiscovered! As well as being fascinating objects to study in their own right, surveying the population of massive galaxy clusters throughout all of cosmic history provides another valuable insight into the growth structure in the Universe. After we had raised the camera back inside the telescope, there was suddenly far less screw-turning that needed to be done. In its place, we started the long process of plugging back in the many different cables needed to operate the camera. Following ‘first light’ in early January, we could finally begin to start looking at data to understand the properties of our upgraded camera. I spent my final week at the South Pole helping with the analysis of this initial data, until the day finally came with a flight that would take me away from this incredible place at the end of the world. I flew out of the South Pole on January 17th with four other members of the SPT team, only five days after our scheduled departure. Reminiscent of my trip down, each day began with checking the flight schedule and engaging in wild speculation as to whether our flight home would actually arrive. Although some of us were leaving, the arriving flight brought in several fresh SPT-ers to take our place and continue working on the telescope until the end of the summer season in mid-February. Following the last flight out of the station in mid-February, we then leave everything in the very capable hands of the SPT winter-overs, who will run and maintain the telescope in freezing 24-hour darkness until next Austral summer. A photo from one of our winter-overs, Joshua Montgomery, showing the annual South Pole sunset at the end of March. This time around I only spent a single night in McMurdo, before boarding our 9 hour-long LC-130 flight back to Christchurch. Landing around 11pm, I experienced nighttime for the first time in over 2 months! Funny that you can miss something as simple as the setting Sun. Seeing as I was already on the bottom of the world, I was able to briefly visit my family back in Perth, Western Australia, before making the gruelling 54 hour journey back to Toronto. I have no idea if I actually slept during those five flights across four countries, but after almost 3 months away, there was no better feeling than finally getting home to my own bed. It’s now been just over a month since I arrived back in Toronto, and have dived right in to developing the software we use to analyze the data being sent to us from the South Pole. There’s no question that my time at the South Pole getting hands-on experience with the instrument has already helped my work back here in Toronto. It is without a doubt a trip I will never forget, and I’m already crossing my fingers that one day I’ll get to venture back to the end of the world! Now, finally time to talk about some of the work that’s been keeping me busy the past 3 weeks! Each day we walk out to the Dark Sector Laboratory (DSL), the building where the South Pole Telescope is located (about 1km from the station). You can also find the BICEP telescope, Keck Array, and Icecube Neutrino Observatory in the Dark Sector area of the South Pole, where ‘dark’ simply means that radio use is restricted due to potential interference with the experiments. The part of the telescope we’ve spent most of our time working on is the SPT-3G camera. The camera itself is responsible for focussing and imaging the microwave light that’s reflected from the large 10-metre primary mirror (and smaller secondary and tertiary mirrors). Weighing over a tonne, we first needed to carefully lower the camera down from the optics bench that couples the camera to the telescope’s dish. Once on the ground, we could finally begin the long process of disassembly and reassembly (twice!). While it might be many times larger than cameras we’re used to using day-to-day, the SPT-3G camera looks surprisingly like a gigantic DSLR. This is because the design is actually very similar; a long cylindrical section containing lenses focussing the light, and a rectangular section at the back contains detectors for measuring the light. These two halves of the camera are contained in whats called the ‘optical cryostat’ and ‘detector cryostat’. These are essentially huge fridges under vacuum for keeping components of the camera at cryogenic temperatures. The detectors themselves need to reach nearly -273 °C to operate properly (only half a degree above absolute zero!). In order to reach these low temperatures, each cryostat is made up of a series of shells that gradually step down the temperature towards the centre. SPT-3G is designed to measure microwave light in 3 different bands; 90 GHz, 150 GHz, and 220 GHz. In order to maximise the optical throughput in each band equally, each lens is covered with a special anti-reflective coating. Over the past year some major advancements have been made in the anti-reflective coating we want to use, requiring us to replace each of the 3 lenses in the camera (including the cryostat window). At almost a metre in diameter, each lens is made out of heavy alumina. Even though they look a solid cream colour, each lens is almost completely transparent to the microwaves we want to measure. They focus the microwave light in much the same way that glass lenses in an optical camera do. Perhaps the biggest upgrade of the SPT-3G camera this season is the installation of ten new detector wafers. Each of these detector wafers contain around 270 pixels, with each pixel able to measure microwaves in three different bands and two polarisations. A lot of my work this year has been spent testing these new detector wafers, providing feedback to the fabrication process to help improve how the detectors operate. A couple of the detectors we tested in Toronto made the cut and have ended up down here at the South Pole to be installed in the camera this year! Due to the way we read out the detectors in the camera, each detector wafer needs to be attached to a set of ‘LCs’. These LCs contain a series of inductors and capacitors that allow us to measure the signal on the resistive detectors in parallel. Another grad student and I spent a week holed up in our little clean-room at DSL assembling each of the ten detector wafers, using tweezers to carefully place hundreds of tiny 0-80 screws. Not for the faint of heart, a single dropped screw onto a wafer can potentially wipe out hundreds of detectors (or worse, crack the wafer). Once we finished assembling each of the ten detector setups, we were ready to start populating them back into the focal plane. Each LC board is attached to a Niobium-Titantium (NbTi) ‘stripline’, with delicate ultrasonic solder joints connecting each end. These striplines carry the signals from the many detectors to SQUID amplifiers inside the cryostat. Assembling the focal plane was a slow and delicate process, where a broken connection in any of the 120 striplines can potentially force us to take everything apart again for repairs. Finally after routing and heat-sinking all striplines, the camera focal plane was ready to be re-installed inside the detector cryostat. At this point the optical cryostat had been completely disassembled, and so it was possible to see the tiny white alumina lenselets above each pixel facing out of the detector cryostat to where the large lenses would eventually be placed. With the help of four chain hoists and an engine jack, the heavy SPT-3G camera was back together again and ready for the second cool-down of the season. The first step is to put the cryostats under vacuum for 24 hours, removing all the warm gases inside that would prevent the stages from cooling to cryogenic temperatures. Once a low enough pressure is reached, we switch on the two Helium pulse tubes (special refrigerators that help us get to -223 °C and -269 °C inside the cryostat). Due to the huge amounts of material that need to be cooled, it takes almost a week for everything inside to reach base temperature. We have currently been cooling for 4 days, with 3 days to go until we can start testing all the new upgrades we’ve made to the camera. In the meantime, I’ve finally found time to write these long-overdue blog posts and catch everyone up with some of the exciting work we’ve been doing! The station is starting to look pretty festive here, gearing up for some big Christmas celebrations. In my next post I’ll look at what life has been like here at the South Pole, with photos from around the station. Hello to everyone from the South Pole!! After 10 days of delayed flights we finally arrived on November 28th, with plenty of work to catch up on over the past 3 weeks. It’s been a while since my first post so there’s a fair bit to cover. First things first, the commute! What was supposed to be 2 nights in Christchurch quickly turned into 6, with our scheduled flight being cancelled each day due to bad weather at McMurdo station. We still had to be up at 5am each morning just in case, and as a result I think we visited almost every coffee shop in Christchurch! Our favourite haunt was a cafe called C1 Espresso, where you can get curly fries delivered straight to you table via pneumatic tubes in the ceiling. We even managed to squeeze in a couple of quick hikes, before finally the day came that our flight was ready to depart. By this point there was a huge backlog of people waiting to fly out to Antartica. To help get everyone onto the ice, we ended up on a 757 flight operated by the Royal New Zealand Air Force. I was even able to head up to the flight deck for a chat with the pilots during the flight! McMurdo station is the largest base on the continent, with a population of around 850 during our stay. Soon after arriving at McMurdo we had to ‘bag drag’, where you check in your luggage for the flight the next day. Unfortunately this leaves you with just your carry-on bag, even if the flight is cancelled. Not knowing that our expected 1 night at McMurdo would eventually turn into 5, I learnt the hard way that I should have held onto some extra clothes… oops. As the weather can be so unpredictable, flights usually get delayed in small 2-hour blocks. This means lots of hanging around and watching the ‘scroll’ (information TV’s around McMurdo), just in case the flight is about to leave. Quite a few times our check-in time got to within 30 minutes, only to be pushed back at the last minute. Our stay at McMurdo coincided with American Thanksgiving (no flights over holiday weekends), giving us the chance unwind and do some exploring on trails around the station. After an long but enjoyable 5 days of hanging around waiting, we shuttled out to the airfield and boarded the LC-130 aircraft that would take us on to the South Pole. I was excited to finally be on our way again, but will definitely miss the 24-hour hot pizza from the McMurdo galley. For the LC-130 flight our seating was just red netting along the sides of the plane, but we were free to walk around a peer out the portholes as we crossed the Antarctic continent. The South Pole is on an ice plateau almost 3km thick, so it was incredible to see huge mountain ranges shrink as they become buried under the ice. We arrived at the South Pole late on November 28th, with the sun still high in the sky (it never sets during the summer!). First off we were shown a quick orientation video and given tips by the station doctor, with each tip being DRINK LOTS OF WATER. Thanks to the high altitude and extremely low humidity, dehydration is a major risk while you acclimatise. Even after drinking multiple litres of water, I spent the first day in bed with a splitting headache that even painkillers couldn’t fix. While some people fair better than others, it took almost a week before I felt like I wasn’t on the verge of a serious hangover. Since arriving we’ve been hard at work on upgrading some major components of the SPT-3G camera. Just this weekend we hit a large milestone in the upgrade and maintenance work, leaving me some spare time to write up a couple of blog posts! Hi astro-enthusiasts, Matt here! I’m a PhD student at the University of Toronto, working on one of the most remote telescopes in the world; the South Pole Telescope (SPT). Perhaps you might have already guessed, the South Pole Telescope can be found at the Amundsen-Scott South Pole Station in Antarctica. The telescope itself consists of a large 10-metre dish, designed to observe in the microwave regime of the electromagnetic spectrum. Thanks to the high altitude (2,835 m) and extremely low humidity, the South Pole provides us with one of the best places on Earth to perform microwave observations (the light we observe can be easily absorbed by water vapor in the atmosphere, something we want to avoid!). The South Pole is a great location for conducting scientific research, but due to the harsh conditions over the long winter, the station is inaccessible for most of the year. Only during summer (around November to February) can planes can fly in or out, leaving behind a brave team of people that maintain the station and experiments during the dark winter months. Last Austral summer a new camera was installed onto the telescope, SPT-3G. As with any new technology, there’s almost always room for improvement. A number of different components on the camera have been identified as needing an upgrade or replacement, requiring a team to deploy to the South Pole over the summer to perform these tasks and routine maintenance. I’m lucky enough to be a member of the SPT team deploying to the South Pole this summer, spending the next two months on the ice enjoying the -30 °C weather and 24-hour sunlight! Getting down to Pole can take a while, with 5 different flights getting me there from Toronto. After 2 days on planes I’ve finally made it to Christchurch, New Zealand, where we pick up the Extreme Cold Weather clothing needed to survive the Antarctic conditions. The next stop on my trip to Pole is McMurdo station, the largest base on the continent. Weather changes rapidly in Antarctica, so it’s not uncommon for flights to ‘boomerang’ at the last minute and turn back around. With any luck, I’ll be arriving at Pole in the next few days! Unfortunately flights to McMurdo are already backed up due to unforgiving weather conditions, so each day we have to get up in preparation for a flight that may not leave. I can’t wait to arrive at the South Pole and find out how well my expectations match reality, all of which I’ll be posting right here! Watch this space over the next two months to find out with me what day-to-day life is like at Pole, and follow along with all the different upgrades we’ll be making to the telescope (after all, that’s why I’m there!). The Dunlap Institute for Astronomy & Astrophysics is dedicated to providing world-class training, mentoring, research opportunities, and career experience to undergraduate and graduate students in the astronomy program offered by the Department of Astronomy & Astrophysics at the University of Toronto. This blog is a record—in their own words and images—of the experiences of students receiving support from the Dunlap to attend conferences and workshops, and to work at observatories and institutes around the world. Please follow and share Observations to see where the students are and what they're up to. OBSERVATIONS Create a free website or blog at WordPress.com.